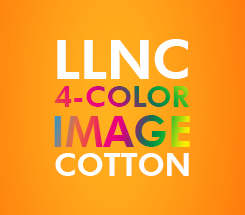 Overview: Application onto Cotton (4-Color Image). Description: This video explains how to transfer your prepared 4-Color transfer media designs onto Light Colored Cotton T-Shirts. NOTE: Preheat your Heat Press until the lower plate if HOT! Always keep the heat press in its closed position. This is to keep both the top and bottom plates of your press, at optimal transferring tempertures. Place your Light Garment (Cotton) on the Heat Press. Press using the Light Garment Settings. Rub the transfer with a piece of cloth for 5-10 seconds or until the paper is warm. Remove the backing paper when it is warm. For Washability, cover with Matt Finish Economy & fix using the Laser-Light (No-Cut) Settings. Place the transfer onto a piece of Paper or Card. Press using the Laser-Light (No-Cut) transfer settings. Separate the paper after 5-10 seconds.